Diabetes is a common problem in Native American communities. More than 16% of American Indian adults have the disease - more than twice the rate of the overall population. Then there are those at risk. Nearly one in three American Indians are pre-diabetic. Cathy Carmichael is working to reverse this trend. She's a registered dietician at the Sacramento Native American Health Center. Today, she's giving a grocery store tour to about a dozen American Indian diabetics and their family members. Her goal is to teach them on how to make food choices that will help them manage - or prevent- chronic disease. "These days, there are a lot of choices. So spending some time looking at them is a good idea," say Carmichael. In the produce section, she points out the pumpkins. She says high in carbohydrates. The more carbs, the higher the blood glucose level. That's something diabetics need to watch out for. "Your green beans, your broccoli, your cauliflower, your spinach, those you can pretty much eat as much as you want because the carbohydrates are so low," she adds. Type-2 diabetes shortens lives, and increases mortality risk. So Carmichael's education here is a matter of life and death. "I don't go home with everyone and sit at their kitchen table... but I think going to the grocery store, walking together, talking together, that's really where the behavior change begins." As Carmichael and her group stroll the aisles, she talks about ways to eat healthy on a budget. "You want to compare costs because usually it's cheaper to buy a five-pound bag than buying one or two carrots." She says the people in her class are on fixed incomes. The U.S. Census shows that more than a quarter of American Indians in the U.S. live below the federal poverty level. That's less than $11,000 a year. Mary Morla uses a large empty cart as a walking aid as she strolls past the baked goods. She says food is expensive. She admits that she still loves donuts, and confesses to eating fast food without shame. "It's hard to diet," says Morla. Morla seems to understand that food choices make a difference in managing diabetes. But she and her family members are also fatalistic about their conditions. "We're all going to die one day," says one of them. "It's up to the Lord when it's our time and place. Nobody can stop it. He's got the plan already." "The diabetes has already taken our eyes, our feet," says another. "We don't take care of ourselves. We don't diet, we don't exercise. We know the consequences. But sometimes you just say in your mind, you don't give a damn. It happens, it happens." says Morla. Cathy Carmichael acknowledges that for low-income Native Americans, managing diabetes is more complicated than simply making healthy food choices. "I think motivation is hard for some people, particularly because there are so many health problems or environmental problems, familial problems that people are dealing with," says Carmichael. "It's a hierarchy of needs. Sometimes people come into my office and we plan on having a nutrition counseling session, but they don't have any heat. So I help them figure out how to get the heat turned back on because that's a priority." Every other week at the Sacramento Native American Health Center, Carmichael leads a diabetes prevention and management program. It's called a "talking circle," a mix of peer support and health education. On a Tuesday morning, participants gather around a long table introducing themselves, perhaps sharing something personal, or giving an update about their health. The members "ooh" and "ahh" when one participant reports a low blood glucose level reading that morning. The native tradition of the talking circle was adapted by an American Indian health worker to help combat diabetes. One study shows the model helps increase health care compliance, decrease feelings of fatalism, and reduce obesity. Cathy Carmichael says 175 people have taken part in the Sacramento circle since it started a few years ago. She says providing social support is one of the best things they can do as a community health center. "Because then our community members know that they're not going at it alone. And there's most likely someone else in our community who has a similar problem, someone else who lives in a trailer with a small refrigerator, someone else who has really high blood sugars and cannot figure out how to control them... I can provide the place, but I think the stories that come from the talking circle is much better than any information that I can provide." The Sacramento Center's talking circle is funded through a federal diabetes program for Indians. The Indian Health Service funds some 400 diabetes programs across the country. The IHS says they have collectively brought down blood sugar and cholesterol levels, and improved kidney function in the native population since 1997. Thirty-nine year old Eddie Mendez has been dropping in on the Sacramento diabetes talking circle for a few years. He's young, but has a lot of wisdom to share with the elderly diabetics. Mendez talks about being raised by a single mom who didn't have the nutrition education or the income to make healthy choices. "My mom raised me on Kool-aid and potato chips. I didn't go to doctors as a kid. My mom was paid under the table. I had asthma, allergies and earaches as a kid. I didn't have health insurance. She didn't have the means at the time. We were poor." Mendez was 21 years-old when his doctor broke the news about his diabetes. "He told me it was a very serious illness, that I needed to control what I'm eating, my sugar intakes and carbs and stuff. But I didn't care." For more than a decade, Eddie didn't take care of his diabetes. He says he did everything a diabetic shouldn't do. He ate poorly, smoked, drank, did drugs. He didn't take medication. Then a life threatening injury changed everything. "I was swimming at the river, walking barefooted which a diabetic isn't supposed to do. And I slid on some gravel hill... and it cut off that much off of my foot. It was 108 that day so the sand was scorching hot. I didn't feel it because I had neuropathy in my feet, so I got second degree burns on top of the cut." The gash on his foot went to the bone. Mendez says he almost died from the gangrene infection. His left leg was amputated below the knee. "I went from being a very active person and running amuck to a person who was very limited in what I could do," says Mendez. "It messed with me emotionally and physically. It was hard. It's still hard. Every day of my life is a challenge." Mendez uses a wheelchair now. He spent last year in and out of the hospital with kidney and congestive heart failure. "I got really, really sick. I could not breathe. Every time I lay down I was drowning in my own liquids in my lungs because of all the fluids I had retained. I was in the hospital for a week that time. That's when they said 'Eddie you need dialysis and I was like, 'No I'm not doing it, because that's a lifetime thing.' And he said, 'Either you die or you go on dialysis.' And I said, 'No I don't want to do it.' My mom came in, she was crying. My cousins came in and they were crying. My sisters came in and said, 'Eddie we don't want you to die.' And I said, 'I don't wanna die either, really.'" Mendez made a tough decision. He chose life. Half his days now are occupied by kidney dialysis treatments. 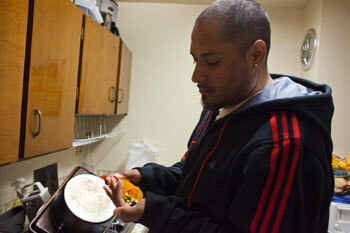 He spends the rest of his time recovering at his government subsidized one-bedroom apartment in downtown Sacramento. He lives on disability and social security income. Mendez' diabetes is under control, but the damage has been done. He takes a dozen medications everyday to stay alive. The pill bottles are strewn across his kitchen counter. "People don't realize that diabetes really is silent killer. It really will catch up with you... I sit there and dwell sometimes, 'If I would've, could've,' but you can't do that. You've just gotta live forward. And do what you have to do to better your life. "Twice a week, Mendez volunteers for a program that serves food to low income seniors on the ground floor of his apartment building. "When I lost my leg, when I came here they were so accepting of me. And at the time I needed it, and now I'm here for them. I get a fulfillment from seeing all their different faces and knowing that I'm doing a good deed. "Eddie is in charge of the books at the registration table today. He knows everyone who walks in by name. "Al's diabetic, Robert's an alcoholic diabetic, John is 86 years old and he lives his life freely." Mendez often uses a wheelchair, but today, he walks with a slight hobble using his prosthetic limb. He stands up to walk back to his apartment, his broad shoulders towering over people sitting in the lobby. He cracks a joke to them as he walks past. "I've given up all these things that I loved so much. It's still in my environment, that stuff is still accessible to me at the stores, but I chose not to partake and giving in to those things. So your environment plays a very big role in your decisions. But it always comes back to you. What do you want? What can you do? What is your choice?" Cap Radio News: Are there personal reasons for your involvement in diabetes work as well? Maldonado: My family, my community, we have a high rate of diabetes. I want to prevent diabetes in my grandchildren. Cap Radio News: Do you have diabetes as well? Maldonado: Yes, I was diagnosed about three years ago. Cap Radio News: What impact has the diabetes epidemic had on the Native American community? Maldonado: It's had a huge impact. Many people watch their family members die from diabetes or lose limbs or go through dialysis and have lots of issues to deal with. It's been an epidemic with Native people. Prior to the 1940's, there was no diabetes in Native Americans. First there was Spanish sovereignty in California, then, there were all kinds of policies against Native people around the gold rush time in the 1850's. Then they were taking children away from Indian families and placing them in boarding schools. So the traditional Indian family unit has just been ripped apart. People are struggling to try to survive.